The modern form of Paint-By-Numbers was a fad that swept the country in the 1950s, but it had an 18th century antecedent in the work of William Gilpin. Gilpin, a landscape artist whose work influenced the Romantic movement, published several books in the 1780s which combined travel writing with Gilpin’s philosophy of art, and included etchings of Gilpin’s watercolors of the scenery. Gilpin advised his readers to construct a table of different colors, each numbered, and carry that table with them when they went sketching. 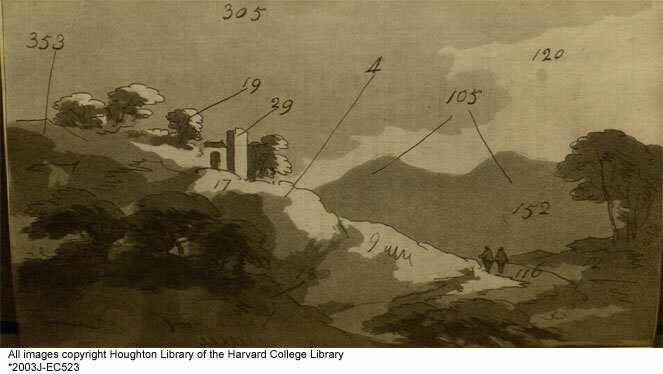 They could then label each feature of a sketch with the appropriate number, to accurately reproduce the colors when painting the scene later at home. Depending on the mood you’re in that day, cataloging a pamphlet with no author, no publisher, no place of publication, and no date, is either an exciting challenge or a real pain in the neck. Fortunately for me, almost everything that was published in 18th century Great Britain has a record in the English Short Title Catalogue, or ESTC. 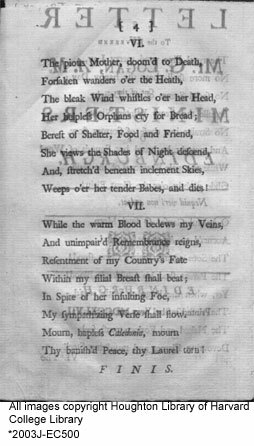 Looking up my title, Tears of Scotland, I was able to find out that it was written by Tobias Smollett, and probably published in Edinburgh in the late 1740s. That would make a respectable enough record right there, but my copy happens to have a little something extra that allowed me to make the record more complete. Bibliographers use the term offsetting to describe what happens when a freshly printed sheet with still-wet ink comes into contact with another sheet, leaving a ghost impression of its text in mirror image. In a happy accident, a wet copy of the title page of a work called A letter to the Reverend Mr. G. Logan offset onto the Hyde copy of Tears of Scotland, which strongly suggests that they were printed at about the same time. Since the Letter does have an imprint, we can now be fairly certain that Tears was printed in Edinburgh in 1747. Thus does the store of world knowledge become exactly one fact bigger. I’m exhausted! In 1779, London was abuzz with the sensational murder of Martha Ray by the Rev. James Hackman, outside Covent Garden Theatre. Ray first met Hackman while she was mistress to the Earl of Sandwich (for whom she bore 9 children), and their affair was apparently intense but brief, ending when Hackman, then in the army, was reassigned to Ireland. Hackman later resigned his commission to join the church, and shortly after being ordained in 1779, went to London to find Ray. Certain that she had taken up with a new lover, he waited outside the theater with two pistols, shooting her in the head when she emerged. He then shot at himself, but only grazed his forehead, whereupon he unsuccessfully attempted to club himself to death with the now useless pistols, before being arrested. The defence pled temporary insanity, noting that Hackman had brought a love letter to Ray with him that night, and Hackman claimed, in a speech that may have been written by Boswell, to have planned to kill only himself. Johnson felt, however, that the fact that Hackman carried two pistols proved premeditation. The jury apparently agreed, finding him guilty, and Hackman was hanged on April 19th, 1779, less than two weeks after the murder. Londoners seeking the juicy details of the sensational trial snapped up ten editions of this work, this copy belonging to the first. Sadly, the Hyde copy is missing the engraved portrait of Hackman which originally accompanied it, depicting a large black spot on his forehead, presumably the result of the unsuccessful suicide attempt.